Since IRS revenue officers are skilled at aggressively pursuing taxpayers, you will want to get IRS revenue officer help from a tax firm as soon as you are contacted by an officer. By seeking the services of Top Tax Defenders, you will create a buffer of experienced tax professionals between you and the IRS revenue officer. Instead of having the officer come to your home or place of business, hiring Top Tax Defenders to represent you means that the officer will have to go through them instead of coming directly to you. One of the most powerful tools a revenue officer can employ is intimidation. Although officers are required to treat you with respect and give you sufficient notice when placing a levy, lien, or seizing your assets, there are officers that do not comply with these requirements. Being verbally abused or swayed into believing that your tax debts must be paid in full immediately is overwhelming, and can be avoided by using the services of Top Tax Defenders. If an IRS revenue officer has contacted you, it's time to get IRS revenue officer help from the professionals at Top Tax Defenders. The team at Top Tax Defenders knows the tricks that revenue officers sometimes use, and can help you understand the truth of your situation. Not only will Top Tax Defenders communicate with the officer for you, but they can help you settle your tax debt for less than you owe, taking care of your IRS problems permanently. 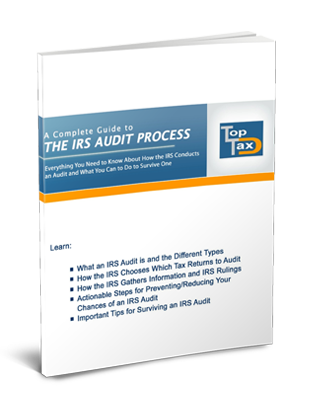 Information about how the IRS audit process works and tips for when you're facing one. "I would like to commend and recommend Top Tax Defenders to anyone with tax problems. They were very professional, communicative and resolved our long-standing tax problems quickly. "